There are situations where ‘just’ one anchor may not suffice. The first that always comes to mind is a storm or heavy wind, when you simply need more holding power. As we discussed in our book Happy Hooking – the Art of Anchoring, your primary anchor should be sized to provide adequate holding in most any conditions. If you feel it is not big enough or the right type, then your first consideration should be upgrading or changing it. Having said that, although we are fairly confident that our anchors are correctly (over-) sized for our boat, we do routinely set a second anchor when we know there is a big blow coming. It gives us tremendous peace of mind. In any case, in a storm situation, your best option is to seek safe harbor so as not be subjected to strong winds and rough seas. Other times when you might consider two anchors include tight anchorages, poor holding (like very soft soupy mud), shifting currents, prevailing swell, the narrow edge of a channel, wishing to position your boat precisely over a noted fishing spot, and so on. Just like there are many types of anchors, there are many ways to deploy them if and when you need them. The most commonly used method to set two anchors is in a ‘V’ configuration. Although the V configuration is what most people think of first in the event of strong winds, if the wind shifts or your boat yaws, your vessel will only be hanging on one anchor at any given point in time, which is not the idea behind deploying two anchors. You also run the risk of the two rodes becoming twisted and tangled leaving you with a mess to contend with when the storm abates. To accomplish this simply motor as usual to windward (1), then drop and set one anchor (2). 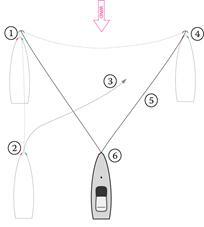 Next, motor across (3) to one side then upwind and drop and set the second anchor (4 & 5). Finally drop back and balance the load between the two (6). Your goal here is an angle between the two anchors of somewhere in the range of 45 to 90 degrees. You might wish to consider setting two anchors in series – one behind the other, which is known as tandem anchoring. U.S. Navy tests show the use of tandem anchors increases total holding power by as much as 30 percent over the same two anchors if deployed separately. To do this, the primary anchor must have an eye or hole at the crown through which to attach the rode to the secondary anchor. The Rocna and Buegel anchors have such a dedicated attachment point. Do not use the hole or connection point for the trip line, which most anchors have, as this may cause the primary anchor to roll and unset during a wind shift. If the anchors should drag or plow through the bottom, then the secondary anchor will find poor holding in the disturbed seafloor created by the primary. Using a plough type anchor for a tandem rig is thus ill advised. Attach a length of chain rode, that is at least as long as your boat, to the tandem anchor connection point with a sturdy shackle – you should only use chain for this. To make later retrieval of the two anchors easier, attach one end of a floating retrieval rope to the shank of the first anchor and the other end to the shank of the second anchor. When setting two anchors in line, lower the secondary (upwind) anchor first. Reverse, pay out the rode and lower the primary anchor prior to setting either anchor. When sufficient rode for the primary anchor has been let out, cinch the rode and (at first gently) power set the anchors. We recently came across the Wemar tandem anchor, which we are looking forward to trying out in the coming months. Their system is in essence two nested anchors, where the secondary is deployed first. Then a chain lock in the shank of the primary is engaged. Then the primary anchor is deployed. Retrieval is the same process, only in reverse. We have sometimes heard the suggestion of deploying two anchors on two rodes in series with a secondary backup anchor upwind of the primary in case this one drags. This is not a good idea. If the downwind primary does drag, then the secondary will be lined up with the furrow of disturbed ground the primary created. If you think your anchor might drag – replace it. If you need to keep your boat in one place, even if the wind or current changes direction, then you may need to set two or more opposing anchors. The Bahamian Moor is essentially the same as the V configuration taken to its extreme – setting the two anchors 180 degrees apart. It allows your boat to swing pointing into the wind or current – whichever exerts the greater force on your boat and wherever it comes from at a given time. It can thus be very useful in an anchorage with a strong reversing tidal flow. This method of anchoring also minimizes your swing radius. It is a configuration you may consider in a tight anchorage, provided, of course, that the other boats do the same. It can be useful also when anchoring close to boats on moorings where their swing radius is quite small, although anchoring in a mooring field is generally not recommended. Bahamian moor – if your secondary anchor has a rope rode, remember to add a kellet to keep it away from your keel. The bow and stern configuration maintains the position of your boat very tightly. 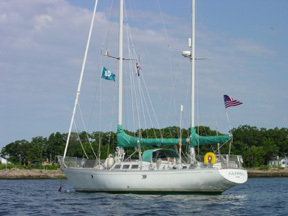 Your boat will not swing into the wind or current and it should only be used when really needed – such as for anchoring at the very edge of a tight channel when you do not want to swing at all or anchoring off a beach when there is a swell coming in off the ocean causing your vessel to rock side to side. Bow and stern anchoring fixes your boat’s position, and is most useful in really tight situations like in a creek, or along the edge of a channel. In some places this is used to anchor close to steep cliffs. It is also very useful in a rolly anchorage. There will come a time when you are securely and safely anchored but your boat keeps rolling from side to side that can make for a very uncomfortable experience. This is quite common in anchorages that are open on one side and where the prevailing wind comes from anywhere but from the head of the harbor. To overcome this you can turn your boat into the waves by deploying bow and stern anchors. We have found that this is very tenable as an overnight or longer term solution for our boat. In European marinas and many other places docking involves anchoring. Many marinas or docks require stern or bow to tie-ups to save space. The so-called Med mooring is basically a variation on the bow and stern configuration. Med mooring uses an anchor to hold one end of the boat while the other is secured to the shore, a dock or a bulkhead, or a mangrove tree. As you come in to the dock pass your lines ashore, or preferably to your new neighbors to bring ashore while steering you in. Once the anchor and dock lines are deployed, firm up on the anchor rode and deploy spring lines to keep the boat aligned fore and aft.